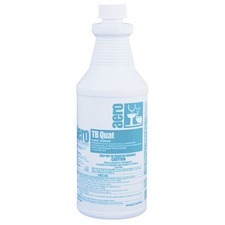 ABC Compounding TB Quat TB, HIV-1, Hepatitis B & C, MRSA, RTU - Liquid - 0.25 gal (32 fl oz) - Fresh Scent - 1 Each Effective against TB, HIV-1, Hepatitis B (HBV), Hepatitis C (HCV), Hepatitis A (HAV), MRSA, Staphylococcus Aureus, Salmonella Choleraesuis, Pseudomonas Aeruginosa, Escherichia Coli, Vancomycin Intermediate Resistant Staphylococcus Aureus (VISA), Canine Parvovirus, and Trichophyton Mentagrophytes (Athlete's Foot Fungus). *SHORTER CONTACT TIMES (3 minutes for most regular bacteria, 30 seconds to 2 minutes for some others, still 10 minutes for bloodborne viruses). Neutral disinfectant cleaner for floors effectively cleans, deodorizes and disinfects in one simple, safe step. Disinfecting formula eliminates and suppresses the growth of harmful microorganisms, such as bacteria and viruses on all nonporous floor surfaces. Plus, its neutral pH will not dull high-gloss floor finishes for safe, repeated use. 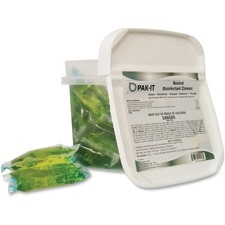 PAK-IT technology dissolves completely into water to eliminate the need to cut, tear or open for fast, simple use. Simply drop one pre-measured PAK-IT into 2 gallons of water. Powerful disinfectant is perfect for use in hospitals, nursing homes, clinics, offices, schools, gyms and more. Oil-Dri clay absorbents undergo a superior moisture-extraction process that increases absorption power and minimizes dust. 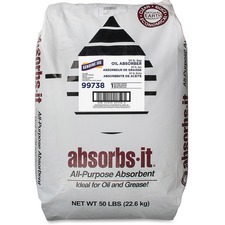 The quality absorbent minerals can be used on oils, coolants, grease, water and other liquid spills. Simply pour, let absorption occur and then sweep up. These absorbents are not to be used with turpentine or vegetable oil. Course granular clay comes in a poly bags made of heavy-duty polyethylene. Badly soiled toilets and urinals need special attention. 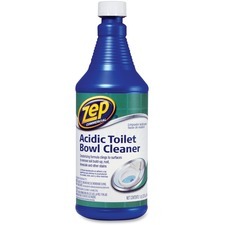 Commercial Acidic Toilet Bowl Cleaner has the power to quickly remove rust, dissolve organic stains and eliminate hard water residue. The 10 percent acid gel formula clings to vertical surfaces. The squirt top makes it easy to apply under the rim. Cleaner leaves a pleasant, fresh minty pine fragrance. This product will not harm septic tanks or drain lines. This versatile cleaner uses a powerful, ammonia-fortified formula to effectively clean windows, glass, windshields, mirrors, displays, counters and more. Advanced surfactant chemistry provides maximum cleaning power without streaking, smearing, hazing or leaving behind any residue or film. 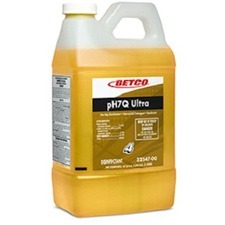 Use this cleaner in commercial and institutional cleaning, manufacturing, installations and other applications where professional performance and quality are required. Cleaner is safe to use on most hard surfaces and removes dirt, grease, oil, smudges and more. 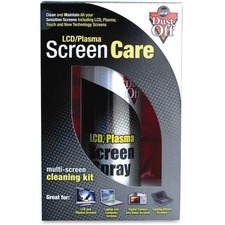 LCD Plasma Screen Care Kit offers advanced cleaning cloth technology with a multiuse cleaner for the safe removal of dust, dirt and smudges from all your electronic screens. Cleaning spray is completely safe for all types of digital screen cleaning, including LCD and Plasma televisions, laptop screens, media player screens, cell phone screens, handheld games, cameras, MP3 and GPS screens. Nonaerosol formula contains no VOCs or alcohol. The aluminum can is 100 percent recyclable. Screen Shammy Microfiber Cloth safely wipes and polishes clean without leaving behind streaks or residue. Cloth is machine-washable for repeat use. Screen Care Kit contains one bottle of cleaning spray and one cloth. 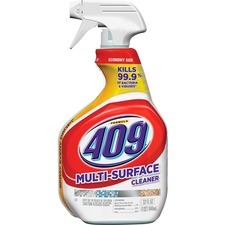 Formula 409 Multi-Surface Cleaner Spray is the ultimate cleaner, degreaser and disinfectant for the home and workplace. The antibacterial formula quickly cuts through grease and grime and disinfects as you wipe, killing more than 99 percent of germs. It prevents mold and mildew growth and deodorizes as you clean kitchen and bathroom surfaces, leaving behind a fresh clean scent. This no-bleach, nonabrasive, all-purpose spray cleaner cleans 40 percent more per spray, based on lab testing vs. previous offering. With the Smart Tube technology, you are guaranteed to spray every last drop. 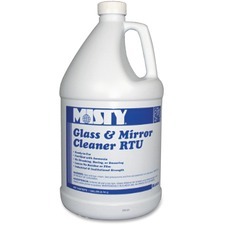 This antibacterial, all-purpose cleaner works great both indoors and outdoors on a wide range of hard nonporous surfaces including stainless steel, sinks, countertops, appliance exteriors and more. strains including VRE and MRSA. Virucidal against HIV-1 (Aids virus), Herpes Simplex 1 and 2 and Influenza A/Hong Kong, HBV (Hepatitis B Virus). Kills Pandemic 2009 H1N1 influenza A virus. Light amber color. Pleasant lemon fragrance This 2 liter product works with the FastDraw chemical dilution system. The bottles contain two metering tips that dispense at a low flow rate for quarts and a higher flow rate for buckets. Tips also insure the right chemical dilution for proper and effective cleaning while reducing cost per use. Curved siphon tubes inside each bottle eliminate waste by insuring complete product evacuation. Sealed spill proof bottles eliminate potential chemical contact with cleaning staff. Bottles are color coded and numbered (#4 in this case) for easy chemical selection and training. Bottles include NAFTA tri-lingual labels for multi-cultural work forces. 4 2 liters/carton. Mr. Clean Magic Eraser Pads feature an innovative cleaning material that penetrates surface grooves where dirt and grime get trapped. Remove set-in dirt on stoves, refrigerators and other appliances. Clean scuff marks and dirt from walls, floors and doors. 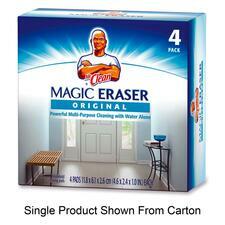 Magic Eraser Pads easily and thoroughly break up tough dirt with just water alone.